My Golden did not expect to see an angel in his yard since he wasn’t outside when I placed it there. Unexpectedly adopted this guy 2 weeks ago. Finding this Keeshond at the Hawaiian Humane Society was an unexpected joy. They normally only have Pit Bull or Terrier mixed breeds. There are no Keeshond breeders on the island either. He was found wandering in a business area. They took him to the Humane Society after no one claimed him. I have checked Internet sites to see if anyone is looking for him and so far no one appears to be. The day before we adopted him is the first time I have been on their site since our Corgi died. I did not feel we were ready for another dog yet, but something made me check the site anyway. 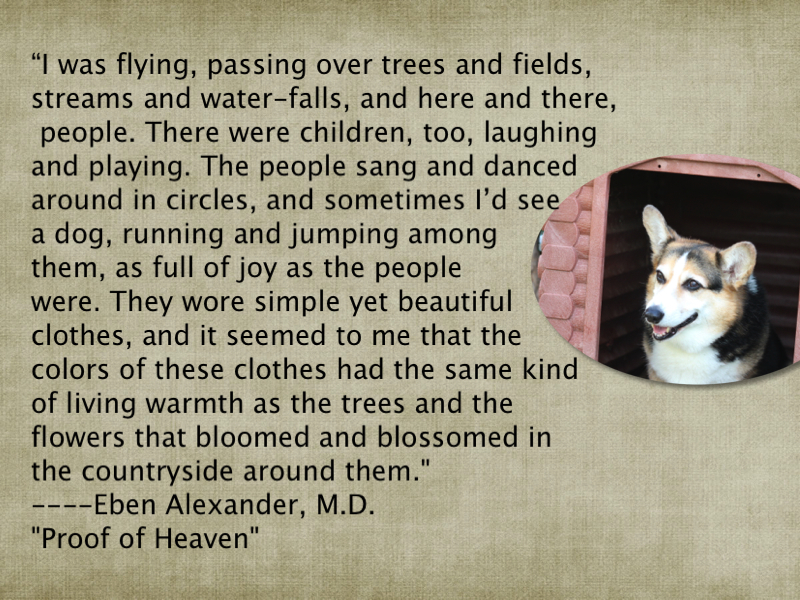 Finding the Keeshond’s picture and information touched my heart. I quickly phoned my husband to convince him. After leaving a message asking if the dog was still available on the Humane Society’s voicemail, I took my Golden outside where a rainbow appeared over my Corgi’s burial site. I took it as a sign that he blessed my decision. 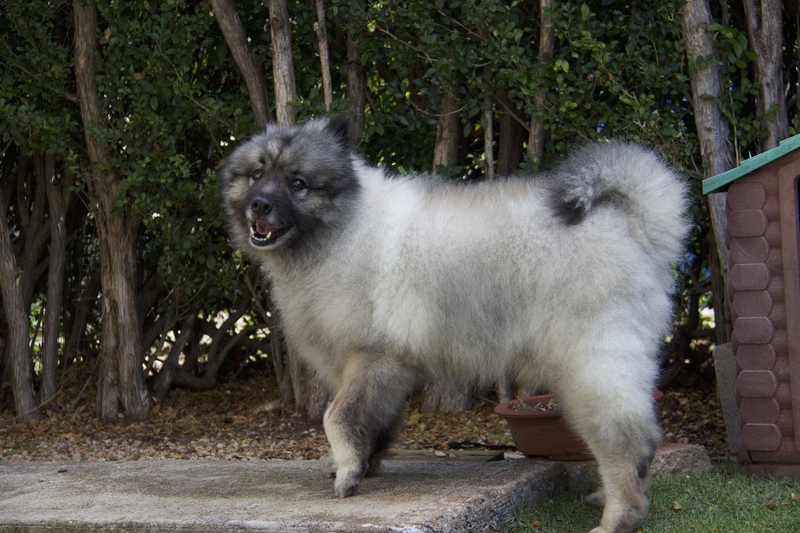 A voicemail the next morning revealed that the Keeshond was at a pet store site for the day. I called the store to make sure no one had adopted him, and we loaded our Golden into the car to go meet our latest addition. 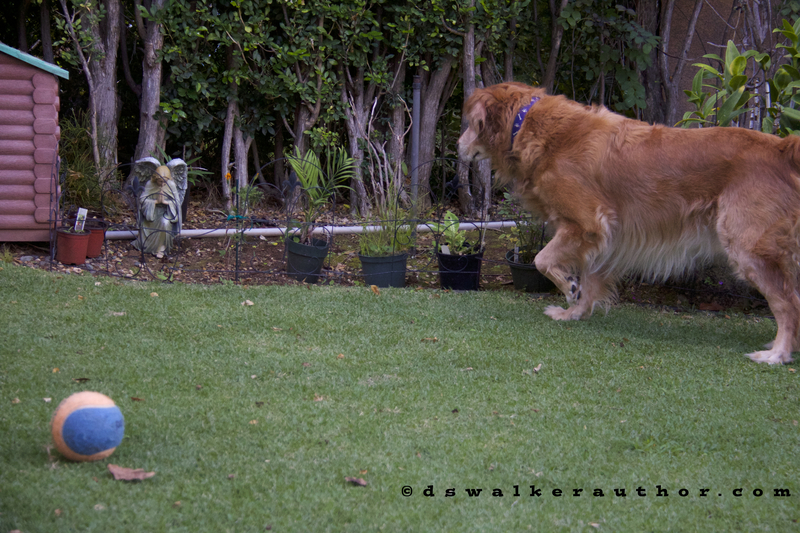 My Golden is happy that the Keeshond is not interested in his ball. 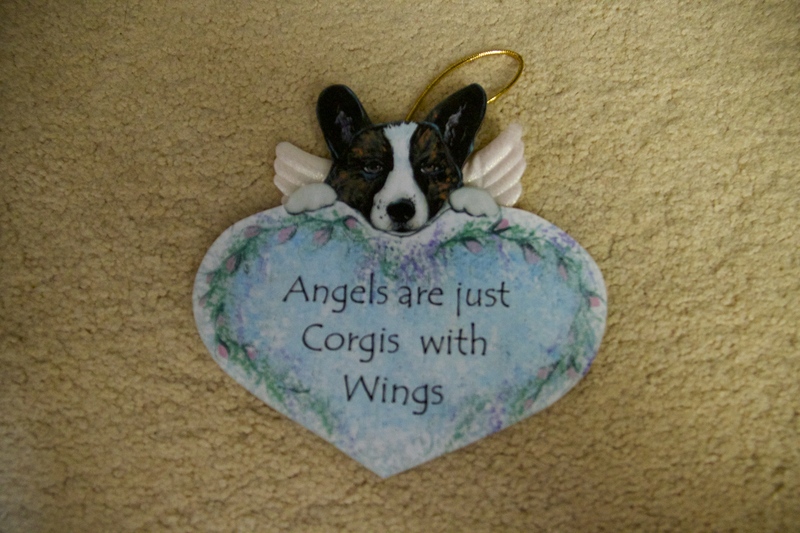 I brought this ornament for our Corgi’s first Christmas. Now he is a real angel. P.S. Go to Weekly Photo Challenge to learn how to participate and to see what others are posting. I like your pooches. It looks like they are happy and smiling in the pictures!!! I guess your Golden saw the angel and thought, hmmmm…. I don’t remember seeing her around here before! Too funny! Thank you Gail. Yes, I thought it was funny too. At least I know he pays attention to what is in his yard. 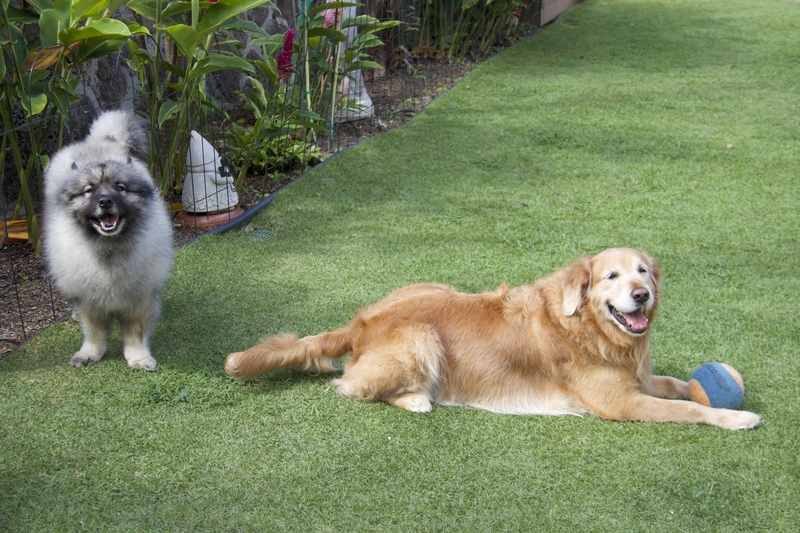 Such cute dogs; the Keeshond is gorgeous! What an incredible looking dog…hard to believe anyone could just abandon him! What did you name him? Mahalo. He already responded to Pepper, the name the Humane Society called him, so we decided to continue using it. We can’t believe no one came forward to claim him. He had an international microchip, but for some reason it was not registered in Hawaii, and they were only able to get limited information about his health records. Since we have the date he was neutered, we think he is 7. Other than arthritis of his left front wrist, he is healthy. He is extremely smart and already knew both voice and hand commands. Pingback: Weekly Photo Challenge – Unexpected | Aircrew - What To Do!